"Creating a business is an endeavor worthy of deliberate thought, creativity and values-based action," says Rena Klein, FAIA and author of The Architect's Guide to Small Firm Management. In an article in the latest issue of Licensed Architect, she suggests strategies for growing firms. Once a firm approaches the 10-employee mark, the principals may start to feel overwhelmed, and the old ways of managing a firm with just a few employees might not be working any more. Klein suggests that architects apply their passion for good design to the fundamentals of the business. She recommends drawing an organizational chart that includes both business management and project execution functions. 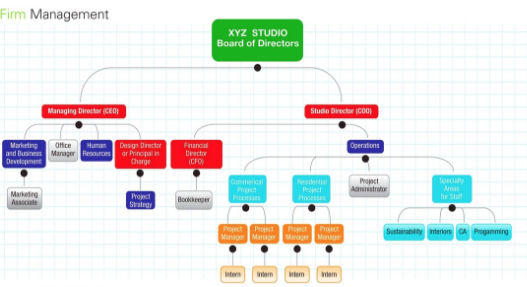 In the above example, a firm of 10-12 employees is managed by the Managing Partner, who is responsible for design and project strategy, and the Studio Director, who handles finance. There are many other variations possible, Klein says, but she stresses that firm owners, aided by the firm's board of directors, work to understand the roles and tasks that must be handled by partners or senior staff and bring them together to determine who can fill those roles. She also advises identifying project support and business management tasks that could be done by administrative staff, and monitoring the process throughout and hiring outside consultants as needed.